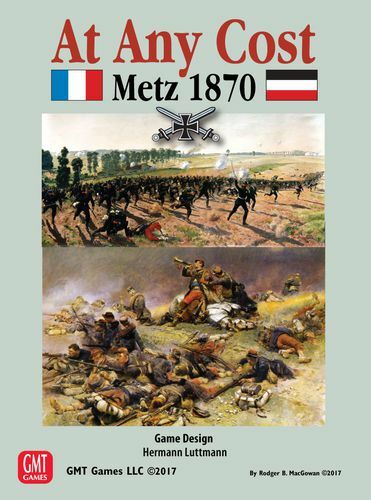 At Any Cost: Metz 1870 also features the Blind Swords chit-pull system which emphasizes the three “FOW’s” of military conflict: fog-of-war, friction-of-war and fortunes-of-war. With each chit pull, players will be challenged to make tough decisions based on their assessment of the current situation. Unlike traditional chit-pull mechanisms, the Blind Swords system ensures that no combat units can be counted on, or conversely, counted out. This yields an environment of tense action and constant surprises – an environment that will challenge each player. All brigades and artillery groups of both the French Army of the Rhine and the Prussian First and Second Armies that took part in these actions are represented in the Order of Battle. Each Strength Point equals 600 infantrymen, 450 cavalry troopers, 3 heavy artillery pieces or 4 light artillery pieces. In addition, units have a Cohesion Rating, representing the unit’s morale, training and experience plus a Movement Allowance. Combat and Cohesion System: The combat system is “firepower” based and utilizes the unit’s size and Cohesion Rating to determine its effectiveness. The combat system is driven by a two-D10 dice mechanic. Two differently-colored dice are rolled simultaneously. The first (colored) die generates an initial result and the second (white) die simultaneously informs the players of any physical casualties suffered by the unit and any morale effect of the enemy’s fire. The assault combat system uses a differential mechanism and results in a more dynamic combat outcome. Orders System: A player must first choose one of four possible Orders that an activated Brigade will operate under – Attack, Defend, March or Regroup. Each Order has specific parameters that provide benefits and restrictions. This Order choice can be critical to a unit’s performance during its activation. Activation Chits = these activate all units of the listed Corps or Cavalry Division. In some scenarios, Activation chits for the French player are fed into the game piece-meal to represent the slow reaction time of the French command structure. But the French player does have some options to speed up this process (see below). CIC Chits = these are special Activation Chits. The Prussian player has a Chief-of-Staff chit and the French player has a Commander-in-Chief chit. These chits allow players to select any one Division (for the Prussian player) or any one Brigade (for the French player) for activation - even if it has already activated or will be activated later in the turn. Thus, this is the opportunity to activate units twice in the turn. Event Chits = there are nine Event chits assigned to each player. At the start of a turn, players select any one of these chits to place in the cup (obviously an Event they really want). Three Event chits are randomly thrown out of the turn and will not be used – the remaining five Event chits are then placed into the cup with the pre-selected chit. In this manner, players are never assured of drawing any particular Event chit, except for the one they initially chose. Each Event chit has a Unique Event side (all of which are different) and a Command (or Common) Event side. The Unique Event is tactical in nature and has specific effects and options for the player to consider. Event examples are Auftragstaktik, Krupp’s Guns, Beaten Zone, Moulin a’ Cafe and Battlefield Conditions. The Command (Common) Event side is used for more strategic options. The Prussian player may attempt to speed up his reinforcements and/or change their arrival location and to curtail the effects of the Prussian Aggressive Tactics Event that the French player may play against him. The French player can use his Command Events to hasten his Activation chit availability and to attempt to cancel the effects of the crippling Bazaine’s Malaise Event. Prussian Strategic Movement: In order to add player input into the strategic off-map movement of the approaching Prussian forces, some scenarios offer the opportunity to use the unique hidden Prussian Strategic Movement system. This involves the Prussian player openly moving units on a special point-to-point map whose results, nevertheless, are hidden from the French player. This will vary where and when the Prussian forces arrive on the map. However, the system is set up so that even the Prussian player cannot be assured of the arrival time or the content of his forces. There will be a solitaire friendly version of this feature, as well. The map is 22” x 34” hexagonal map of the entire west of Metz. Each hex equal approximately 500 yards and contains all the significant terrain details – elevations, slopes, woods, towns, quarries etc. Tutorial – a small, limited battle depicting the fighting around St. Privat on August 16th, which at one point resulted in 6,000 Prussian Guardsmen casualties being inflicted in 15 minutes! This scenario serves as a teaching experience for new players. The Battle of Mars-La-Tour – the whole battle beginning at 8:00 am and continuing the entire day. There are two variations offered – historical and free-setup deployments. There are also options for a historical reinforcements schedule or a variable schedule utilizing the Prussian Strategic Movement system. The Battle of Gravelotte-St. Privat – – the entire day-long battle. There are two variations offered – historical and free-setup deployments. There are also options for a historical reinforcements schedule or a variable schedule utilizing the Prussian Strategic Movement system. Campaign Scenario #1 – the game begins with the Mars-La-Tour scenario but continues past the first day until the campaign victory conditions are achieved. Campaign Scenario #2 – the game begins on August 15th and the French player must march the entire Army of the Rhine across the map to escape to Verdun or, as a secondary option, protect the army from destruction. The Prussian army’s movement is done entirely via the Prussian Strategic Movement system until they enter the game map. This scenario gives players the option to shape an entirely new campaign.